Is there a better alternative to iClean Folder Icons? Is iClean Folder Icons really the best app in Icons category? Will iClean Folder Icons work good on macOS 10.13.4? 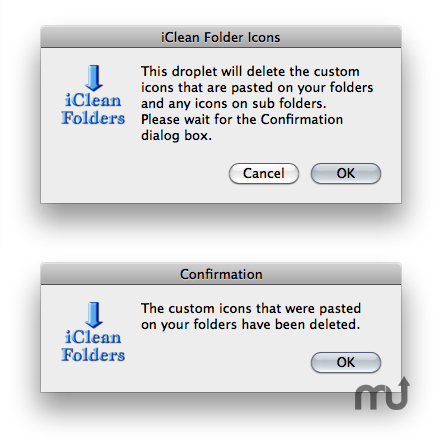 iClean Folder Icons deletes custom icons that were pasted on your folders via the "Get Info" window. It also deletes the invisible 4 KB icon file. Simply drag and drop folders on top of this application and it will delete the custom icon on the folder and any icons on sub folders. Note: The Finder will refresh prior to the Confirmation dialog box. Added a starting dialog box. iClean Folder Icons needs a rating. Be the first to rate this app and get the discussion started!